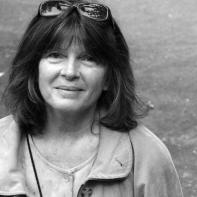 A finalist for the National Book Critics Circle Award, Dorianne Laux's fourth book of poems, Facts about the Moon (W.W. Norton), is the recipient of the Oregon Book Award and was short-listed for the Lenore Marshall Poetry Prize. Laux is also author of Awake, What We Carry, and Smoke from BOA Editions, as well as Superman: The Chapbook and Dark Charms, both from Red Dragonfly Press. Recent poems appear in Cimarron Review, Cerise Press, Margie, The Seattle Review, Tin House and The Valparaiso Review and her fifth collection of poetry, The Book of Men was published by W.W. Norton in 2011. Laux teaches in the MFA Program at North Carolina State University. and shampoo. It's what they have.